Castleknock Hotel is perfectly positioned on the suburbs of Dublin. This allows you to enjoy the best of both worlds with the space to escape and unwind and the city life only around the corner. The fabulous spa was refurbished and reopened last December, making it even more fabulous. 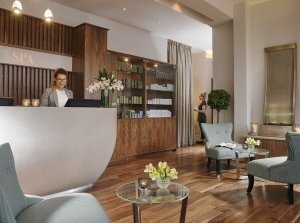 Working with the luxurious brand Elemis and secondary brand VOYA, choose from a variety of treatments to have you feeling rested, rejuvenated and full on pampered. Take your pick of massage, facials, nails, makeup and tanning. Enjoy the Elemis BIOTEC Firm-A-Lift worth €110. This unique blend of targeted massage and sculpting galvanic technology will help you achieve a remarkably lifted and contoured complexion. Available Monday-Friday Only, Not available on Bank Holiday Weekends, Expires 31st December 2018, Prize is for one person only, Cannot be exchanged for cash.